The most scientific sci-fi game ever produced! 2 - 5 players design rockets to explore and industrialize the solar system. They will need to find water as reaction mass for their rockets. Points are awarded according to the scarcity of the space-products produced, glory, colonies, and mega-engineering projects. A boxed game with rocket, freighter, and factory plastic pieces, along with rules, patent cards, rocket diagrams, and a mounted "delta-v" map of the inner solar system. The basic game goes out as far as the asteroids of the Main Belt and the Jovian Trojans, and the expanded game (also available Oct 2010) adds Jupiter and Saturn. When people finally emigrate into space, the motivation will be space nanofacturing using processes possible only in zero-gravity and high-vacuum conditions. The key to economic production is finding water on suitable worlds, for rocket propellent and life support. Also key is designing efficient rockets and the remote-controlled machines called robonauts to do the grunt work. Each space mission must be flexible due to changing conditions and emergencies. A chart keeps track of supply and demand of various space products. 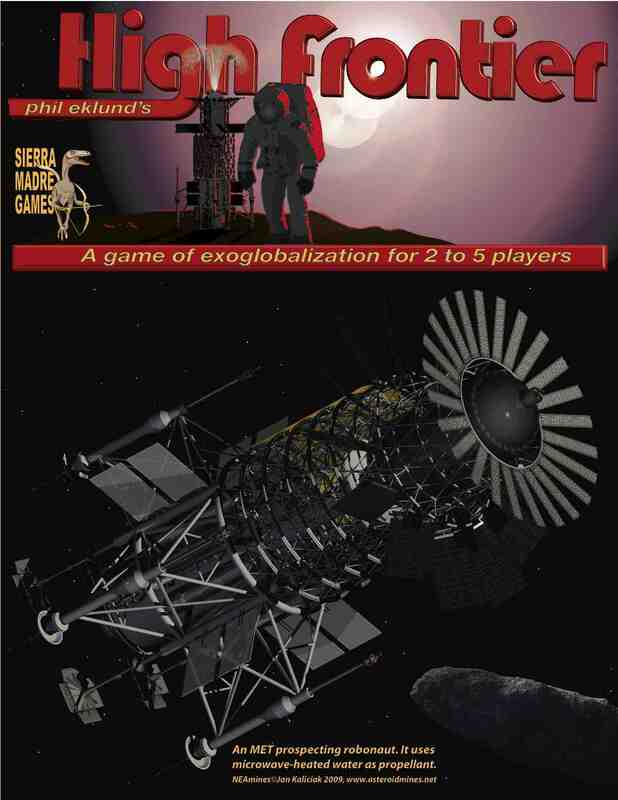 Other products in the "High Frontier" series.